For your convenience, we now provide an online reservation form. Complete and send it to us in minutes! Not only are our rates affordable, but we include all of your necessities such as water, electricity and more. We continue to receive recognition for our clean, spacious and convenient facilities. See for yourself! Shallow Creek offers discount rally rates! Park 10 to 16 rigs for at least two nights and receive $8.00 off the nightly rate! Welcome to the new website for Shallow Creek RV Park. We are proud to have been voted the number one RV Park in Texas in Trailer Life Best of Best, and we guarantee that each of our customers will be satisfied with our facilities, service and staff. We invite you to browse our website to find out more about Shallow Creek, and look forward to making our park your home. Shallow Creek RV Parks Gladewater Texas, We are comfortably nestled in the Piney Woods of East Texas. 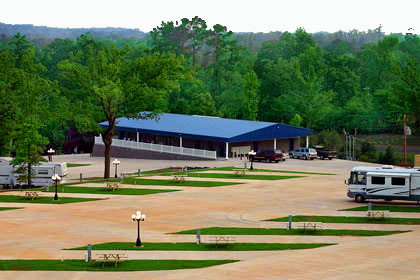 Rated one of the top RV parks in Texas in 2011 by The Trailer Life Directory, we are conveniently located between Kilgore and Gladewater, just off of I-20. Our location includes access to Gladewater's antique district, Kilgore's East Texas Oil Museum, and Lonestar Speedway. Opportunities to experience East Texas culture at its fullest abound. East Texas's rich history and culture are just ready to be discovered. When you're looking for an exciting vacation, be sure to plan your trip around a few of our area's finest events. Experience the Great Texas Balloon race, held every summer at the East Texas Regional Airport. The annual Texas Shakespeare Festival brings professional actors to the Kilgore College stage each year. Longview's Alley Fest brings Art, Music, and great food to the area every year. The Texas Rose Festival celebrates the beauty and history of Tyler's famous roses. We are proud to offer 63 over-sized RV sites, with cable TV and wireless Internet access, a 5000 square foot clubhouse, and a full kitchen. We are Big Rig friendly with 100% concrete roads and generously spaced sites. Our swimming pool will cool you off during those toasty East Texas Summers, and our hot tub can relax your cares away. We know you have many choices when it comes to choosing from RV parks in Gladewater Texas and the surrounding area, but we feel that you will truly enjoy your time at Shallow Creek RV Park. Come and experience our great TX hospitality. We feel we’re the best of the RV parks Gladewater TX. Copyright 2011 Shallow Creek RV Park. All rights reserved. Website designed by Speedy Media, LLC.